Pittsburgh manager Pie Traynor trudged back to the Belmont Hotel in Chicago wondering what the hell had just happened. Four weeks earlier, his Pirates led the National League by seven games. Fans in Pittsburgh were buying World Series tickets. The club had expanded the press box to accommodate all the writers who would be descending on Forbes Field from all over the country. But now the lead--and, as it turned out, the season--was gone, thanks to one swing of the bat from Gabby Hartnett. For much of the season, the Chicago Cubs had been the least of Traynor’s concerns. As late as August 20 they were nine games out, in fourth place. In September, though, the Cubs were unstoppable. Heading into a September 27-29 series against the Pirates in Wrigley Field, they had won 18 of 23 games and had charged to within 1 ½ games of the lead. A gutsy 2-1 victory by sore-armed Dizzy Dean in the series opener put Chicago right on the Bucs’ heels. A raucous crowd of 34,465 jammed Wrigley Field on Wednesday, September 28th as the teams sent two of their best pitchers to the hill for the second game of the series. Traynor went with 30-year-old rookie Bob Klinger (12-5) while the Cubs countered with 19-game winner Clay Bryant. Sloppy defense by the Pirates gave Chicago a 1-0 second-inning lead, and the game stayed that way until the sixth, when things got wild. The Pirates shrugged that off to score two in the top of the eighth on run-scoring singles by pinch-hitter Heinie Manush and Handley, yet they easily could have had more. With the two runs in, men again at the corners, and this time no outs, Al Todd bounced back to pitcher Bill Lee, who threw home to erase Manush. Then, curiously, Traynor allowed Klinger to bat for himself. It ended in the worst way possible--a 1-6-3 double play. The Cubs were in trouble, but still alive. Ripper Collins singled to lead off bottom of the eighth, which prompted Traynor to lift Klinger in favor of Bill Swift. But the right-handed Swift, who had pitched a perfect eighth on Tuesday, didn’t have it on this day. After Billy Jurges walked, veteran Tony Lazzeri laced a pinch-hit double to right field, scoring Collins and advancing Jurges to third. With the Cubs’ faithful in a frenzy, Swift intentionally walked Stan Hack to load the bases for Billy Herman. The all-star second baseman responded with a line-drive single to right. Jurges scored to tie the game, but Paul Waner’s throw cut down pinch-runner Joe Marty, heading home with the potential go-ahead run. 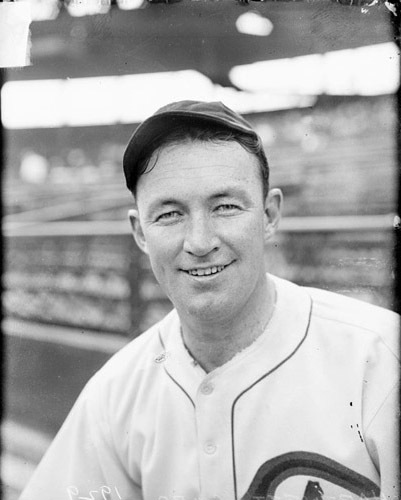 Traynor yanked Swift in favor of workhorse relief ace Mace Brown, who induced a rally-killing double-play ball off the bat of Frank Demaree. The Pirates, though down only a half-game were emotionally spent. The Cubs, on the other hand, came into the series finale the next day feeling invincible. “We could’ve beaten nine Babe Ruths,” crowed Herman.8 They crushed the Bucs 10-1, which all but wrapped up the National League pennant. Traynor, who was fired after one more season, never got over it. Long afterward, he insisted that the umpires should have called the game in the ninth. “I think [years later] he was still very bitter about that,” according to a friend, Chuck Reichblum. “That was probably the biggest disappointment in his life. That was the only time I ever heard him be in any way bitter or regretful.”9 After the World Series, Traynor beat a hasty retreat the woods of Wisconsin, where he spent much of the snowy winter hunting and trying to get away from it all. 1 Chicago Daily News, September 29, 1938. 2 Connellsville (PA) Daily Courier, September 23, 1958. 3 Bob Smizik, The Pittsburgh Pirates: An Illustrated History, (New York: Walker, 1990), 57. 4 Jim Enright, Chicago Cubs (New York: Macmillan, 1975), 80-81. 5 Marc Zarefski, “’Homer in the Gloamin’’ Most Memorable,” MLB.com, August 8, 2007 (accessed February 4, 2014). 6 Lawrence Ritter, The Glory of Their Times (New York: William Morrow, 1984), 344. 7 Pittsburgh Press, April 27, 1942. 8 Donald Honig, Baseball When the Grass was Real (New York: Berkley Publishing, 1974), 137. 9 Chuck Reichblum, telephone interview, September 28, 2006.